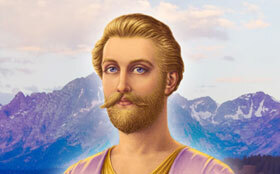 Would you tell us more about Saint Germain as the master of the Aquarian age? What can the “little people” do? Is it possible for someone with less attainment than Jesus or Saint Germain to use the laws of alchemy? Quite a movement has been going on in America—the search for the guru, the search for the teacher. It seems that we as a people understand that we need a teacher. Somehow we sense that the place we want to go, but can't quite get to, can be reached through a teacher. So the imported gurus of India have come and played their parts on the stages and theaters of the nation. And some have remained and sustained a following and others have gone with the wind. We are entering into a spiral of the blending of East and West, of the understanding of God as consciousness that comes down from the ancient traditions of the masters of the Himalayas as well as from the Lord Christ and the prophets of Israel and from all that has gone on in our Western culture. There was a time in the period of the development of Israel when there were no kings but only judges in the land because none were worthy to be king. The word king is a code word, or an abbreviation, for “the one who holds the key to the incarnation of the God flame”—k-in-g. 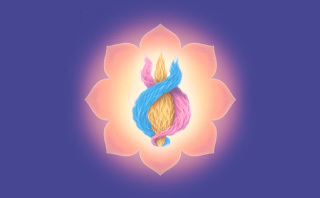 The one who holds the key for our incarnation of the God flame in America today is the Ascended Master Saint Germain. This does not make Jesus Christ of any less importance in America. It means that what we have learned from Jesus Christ as our great teacher of the Piscean age and as the World Saviour has prepared us to meet our next teacher, our next master. Beloved Jesus the Christ has prepared the way for us to follow Saint Germain. Saint Germain, who was embodied as Saint Joseph, protected Jesus as he was preparing for his mission. America is in her childhood today and Joseph, the protector of the infant child (the Divine Manchild who is brought forth by the Woman clothed with the Sun) is Saint Germain. Saint Germain has a special message for this seventh age and this seventh dispensation. And this is why he is referred to in the Book of Revelation as the seventh angel. The seventh ray is the ray of alchemy, of science, of freedom, of transmutation and transformation. It is also the ray of the royal priesthood of the Order of Melchizedek. All of these components go into making up the energy of the seventh ray and the violet flame. The violet flame is the gift of the Holy Spirit that Saint Germain unlocks for us and teaches us how to use in the laboratory of the soul. The soul becomes the scientist in her own laboratory—in her own subconscious mind and in her own superconscious mind—working with the energies that Moses discovered to be the I AM THAT I AM, working with the energies that Jesus defined as the Christ, or the eternal Word, the Logos, by which the creation was framed. This two-thousand-year cycle, then, is a period of learning, a period of transition, a period when we must secure our freedom: freedom in America and freedom for oppressed peoples everywhere. If we do not pass this initiation as individuals, gaining our freedom from personal tyranny, and if we do not pass this initiation as a community and as a nation, we will not be able to continue in the path of initiation over the next two thousand years. Instead, we will find ourselves at the mercy of some sort of superstate or supereconomy, where the nations of the world are utterly controlled by the elite through their control of the money and the money system. We see this happening today both through government and through the multinational corporations. So, even when the little people of the world lift up their heads in outrage, nothing can be done because power (and money is power) is vested in the hands of the few. And the few are representing their own vested interests rather than the real interests of the children of God on earth. What can the little people do? We can begin right where Saint Germain begins. He has written Saint Germain On Alchemy: Formulas for Self-Transformation, a paperback book that contains vital information on how we can begin right where we are, right with what we know, and go into the secret chamber of the heart and find there the flame of life. This flame of life right within us has the unlimited power, wisdom and love of God, which when invoked and released can bring forth that precipitation of energy, of enlightenment, of all that we need to know to be in action for the Coming Revolution—all that we need to know to turn around what is happening in the downward spiral of civilization and create an upward spiral. Saint Germain comes, as Jesus did, to overturn the moneychangers in the temple. He comes in this age for the redress of grievances being practiced against the people, even as Jesus came in his time to correct the darkness of the Sadducees and Pharisees, even as Gautama Buddha came in his time to challenge what was happening in a decadent Hinduism. The thing we have to realize is that the way religious thought goes is the way government and the economy will go. This is because religion, even if it is rejected, forms the basis of the culture and of the self-awareness of a people. If people do not have the correct understanding of their rightful and lawful relationship with God through Christ, through the Great White Brotherhood, they are not free to act with the full power and authority of God behind them. They fear to act for fear of the consequences, and therefore they do nothing. And the fallen ones, who have wrested the secrets of the universe, manipulate God's energy and manipulate the masses through the media. They move in and take more and more and more, even while they lead the people down the primrose path of a pleasure cult and a self-indulgence whereby they neglect the important details necessary to their survival, both spiritual and material. Saint Germain is concerned about our material survival in America and in every nation, because the material foundation of life is the basis for all spiritual preoccupations. We cannot completely lose ourselves in the spiritual, in meditation, in the enjoyment of God, but we must bring back—as Gautama Buddha did from the planes of nirvana, the planes of bliss and enlightenment—that which we have gleaned. And we must take practical measures right down here on the city council, right here on the school board, right here with the problems of integration. This is where life is happening. This is where policies are being made that affect the future of our children and our nation. We don't know how to analyze because we have not been given the standard of the Christ consciousness. Saint Germain comes to bring us that standard. In his book Saint Germain On Alchemy, Saint Germain begins telling us right in chapter one how Jesus walked on the water. And he explains that it was a transfer of energy from the body of Jesus to the body of Peter that enabled Peter to also walk on the water. Saint Germain illustrates for us a basic law of alchemy that can be demonstrated in this magnificent guru-chela relationship he is offering us today. 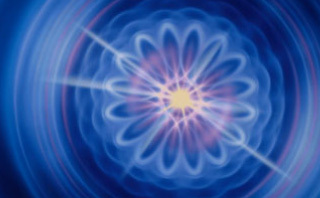 The law of transfer of energy is vital to the science of alchemy; for without it, it is impossible to “create” Matter. It is a law that nothing cannot create something. Is it possible for someone with lesser attainment than Jesus or Saint Germain to use the laws of alchemy? It's possible for you and for everyone who puts his mind to it. Anyone who is capable of a basic grammar school education is capable of studying this book by Saint Germain. It is written in simple English, and it is a conveyance of Saint Germain's heart flame. Saint Germain has said that he overshadows and stands over each individual who reads this book to sponsor that soul if the soul responds to his call. Those who want to be disciples of the real guru of the age can respond to Saint Germain's heart call by receiving the Pearls of Wisdom, which are our manna in the wilderness. 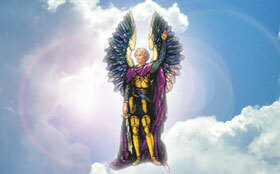 They come to us each month as the daily bread from the ascended masters. I would also encourage all to consider reading Saint Germain On Alchemy, which Saint Germain has given as the gift of his heart to all who would bear the light in the Aquarian age.